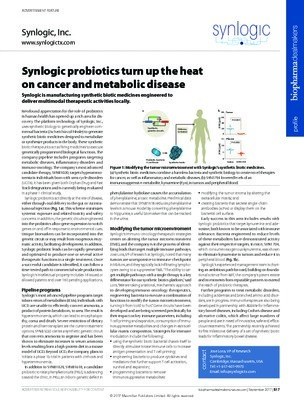 Synlogic’s innovative new class of Synthetic BioticTM medicines leverages the tools and principles of synthetic biology to genetically engineer probiotic microbes to perform or deliver critical functions missing or damaged due to disease. The company’s two lead programs target diseases known as inborn errors of metabolism. Patients with these rare metabolic diseases are born with a faulty gene, which inhibits the body’s ability to break down commonly occurring by-products of digestion that then accumulate to toxic levels with serious health consequences. Delivered orally, Synthetic Biotic medicines are designed to act from the gut to compensate for the dysfunctional metabolic pathway and have a systemic effect, clearing toxic metabolites associated with specific metabolic diseases. In addition, the company is leveraging the broad potential of its platform to create Synthetic Biotic medicines for the treatment of more common diseases, including liver disease, inflammatory and immune disorders, and cancer. Synlogic is collaborating with AbbVie to develop Synthetic Biotic-based treatments for inflammatory bowel disease (IBD). For more information, please visit www.synlogictx.com.